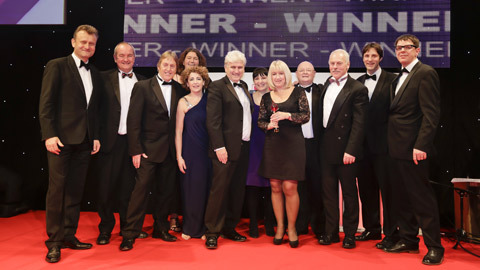 Magnox, the nuclear energy specialist, was named overall winner at the Personnel Today Awards last night. The company scooped the top prize at the ceremony at the Grosvenor House Hotel in London after winning the award for talent management. The Personnel Today Awards recognise and reward achievement and success in all sectors of human resources by both teams and individuals who have made an outstanding contribution within the HR profession. Around 850 HR professionals from some of the UK’s top employers were entertained by comedian and host Hugh Dennis. In all, there were 19 categories, plus an overall award for the very best. In deciding the overall winner, the judges praised Magnox for creating an imaginative programme to address skills challenges. It noted that the company often needs to rely on specialist capabilities in remote locations. In particular, the judges pointed to how the company had developed partnership arrangements with its competitors and public-sector support bodies, as well as the way it had engaged with trade unions. Mondelez International, formerly Kraft Foods, won HR Team of the Year after steering the company through a major change initiative where they moved more than 3,000 employees across multiple sites and brands onto new terms and conditions. Furniture retailer IKEA won the Rewards and Benefits Award for the second year running, garnering praise for its programme for older workers. The company also won the Award for Global Excellence in HR, upon which the judging team commented that IKEA had “clearly demonstrated a global approach to a problem with both international and local ramifications”. The coveted HR Director of the Year award went to Tea Colaianni from Merlin Entertainments, the company behind theme parks such as Legoland and Alton Towers. The judges in this category praised Colaianni for being “a strong and effective leader both within HR and in championing the cause of people across the business” and “a remarkably determined and talented individual”. Since joining Merlin in 2010, she has reshaped the HR team from having little strategic focus into one that could deliver results and add value. Personnel Today’s HR Rising Star Award was won by Rachael Edwards from Mercedes-Benz. Rachael set out to improve perceptions of HR within the company and has introduced a number of successful projects in this vein. In his speech, Moss led a round of applause to representatives from the Olympic Delivery Authority, the London Organising Committee of the Olympic Games and Paralympic Games (LOCOG) and McDonald’s for the successful HR initiatives behind London 2012.